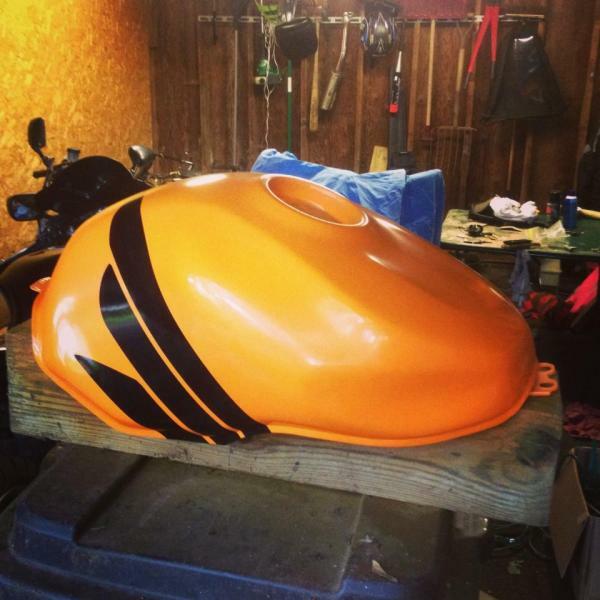 So in deciding to go with a repsol replica hawk, my first step was to get the tank the right color and get the wings for the tank. With the matched base and colorcoat from colorrite, and the wing from alloutgraphics.com, I think I came pretty close to nailing it. If anyone was wondering about these two companies, I would definitely recommend them. They ship quick and their products are outstanding. Will post a pic later. Last edited by stumplove; 07-29-2013 at 03:44 PM. finished product!! So shiny without even buffing/polishing! Looks like you have a great start stump!!! Keep us posted. Yeah I hate rattlecans usually but I didn't want to cough up over 60$ for a pint in a can. The 11oz spray cans were enough to do 3 coats of base with a light 1000 grit sand in between and 3 full even coats of color with no sanding between coats. The 6oz clear was enough to do 3 full layers of clear as well. This was the first time I've cleared over graphics too, and I'm so glad I did, the sheen is so nice and even. I'm so glad I didn't cheap out on the paint. True story, you get what you pay for. Ive been looking for good painters in my area and the general opinion is that theyre all more or less crap. If Im going to pay for a crap paintjob, Ill risk it and do it myself for 1/4 the price. Ive had good luck thus far. Im also starting to do my own powdercoating so I hope to be a one-man custom shop soon. lol. Chinese Repsol fairing just arrived. Your tank is beautiful. I just received my Chinese Repsol fairing from AddMotoR. Had seen favorable videos on youtube. Quality is disappointing, would only recommend to an exp mechanic. Lots of fasteners to buy, no problem there. Molds are crude. Word Repsol above headlight is good, but the L on the left side fairing half does not line up. 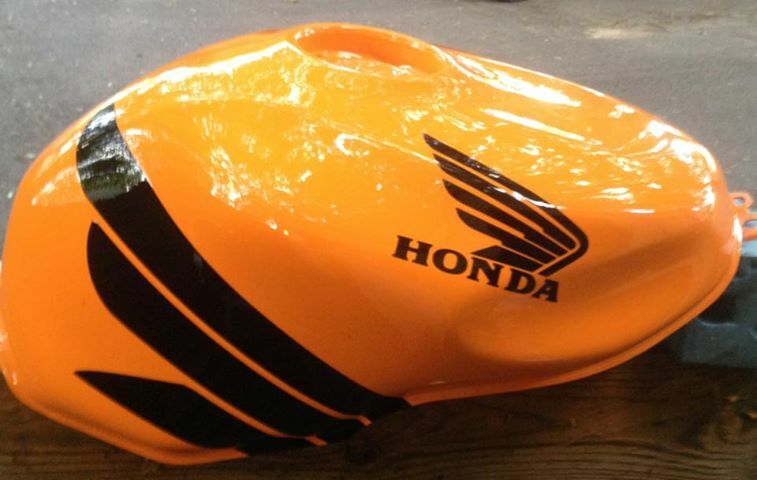 The Honda paint jobs are perfect, this is not. Might ask them for 2 new parts whose Repsol graphic lines up. Grade before attempted install: D. It is beautiful from 10 feet away. A little rough on closer inspection. Paid $488. Will knuckle down and complete the metamorphosis. Bought spare tank on eBay. Anybody else buy a Chinese kit? and perhaps a few $$$$ if you were not aware of this poor quality possibility. I know I ordered the seat cowl a few years ago, and finish on it is far from perfect, and, rear light sits off center. I also expect the light to eventualy break the tabs off from vibrations since these are quite flimsy. I got off with a 150$ invoice and was pissed when I saw it. I can only imagine your disappointment after a 500$ invoice.